I just heard on twitter (where, I kid you not, I learn all the really important stuff) that the first ramps will be at the Union Square Greenmarket the second week of April. This means spring. Last year, when I got word that ramps would be making their spring debut, I got up early to go to the market before work to get some. Well my source (twitter) had been wrong and the farmer had one lonely bunch of ramps, a visual promise that the little wild leeks would definitely be there in bunches the following week. I must have looked pretty heartbroken—if there’s an adult who will cry over vegetable disappointment, it’s me—because the farmer tore a green top out of the smelly bouquet, ripped it in half, and together we ate, toasting the coming spring. This is all to say that it’s not that time yet. When it is, you better believe that I’ll be pickling and pesto-ing the heck out of some ramps. Until then, I am enjoying around with less seasonally-dependent canning and preserving projects. My retail therapy is typically food related. I went on a spice binge recently, the spoils of which included a good amount of yellow mustard seed and some decent quality dried tarragon. I had some leftover wine in the fridge, the stars aligned, and I made mustard. 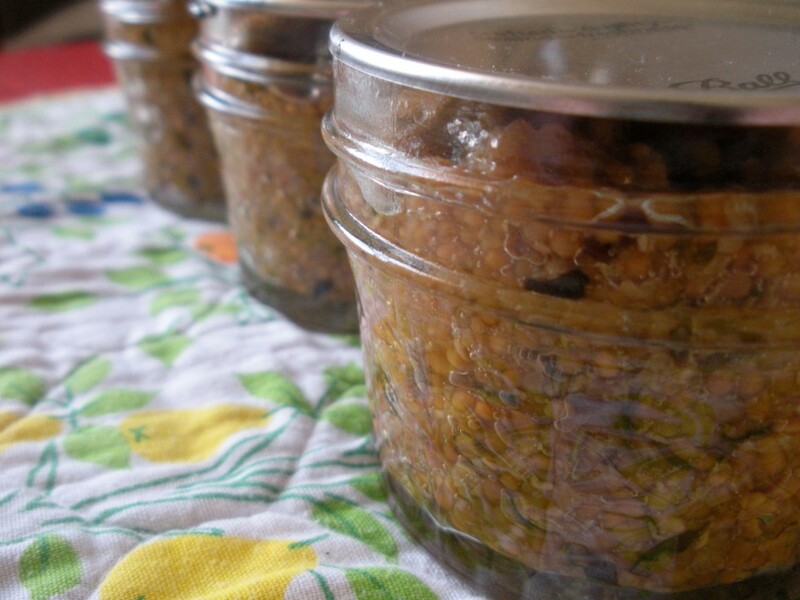 This is a tweak of a mustard recipe from the Ball Complete Book of Canning and Preserving. It was my first time making mustard and I was surprised at how easy it was. It has quite a bit of bite because I used standard white vinegar, rather than the white wine vinegar that the original recipe called for. This is an upgrade, if you ask me. The one thing I might play with next time is the texture. What looked like a “slightly grainy” texture in the blender, was pretty grainy after cooking. I don’t dislike it. In fact, I think it’s far more interesting than the yellow stuff, but I’d be curious to see if I could get it a little smoother. 1. Place 1/8 cup of the dried tarragon in a spice bag. 2. Over high heat bring the wine and the spice bag to a boil. Turn off heat, cover, and let steep for 5 minutes. 3. Add mustard seeds and allow to stand at room temperature for about 2 hrs. 4. Remove the spice bag, squeezing it to extract as much liquid as possible. 5. In a medium sauce pan combine the wine soaked mustard seeds and all of the remaining ingredients. 6. Bring to a boil over high heat, then reduce heat to low. Simmer for 20 minutes. 7. Process in a water-bath canner according to the directions in steps 7 and 8 here in the original recipe. We great mustard last year mostly for the leaves, but got very excited when the seed pods arrived. Unfortunately, before we could harvest them, they were infested with aphids! Argh. This year I’m really hoping for at least one batch of homegrown mustard.